Situated between two major rivers, Philadelphia finds its rich history formed by a bustling merchant trade shipping industry. 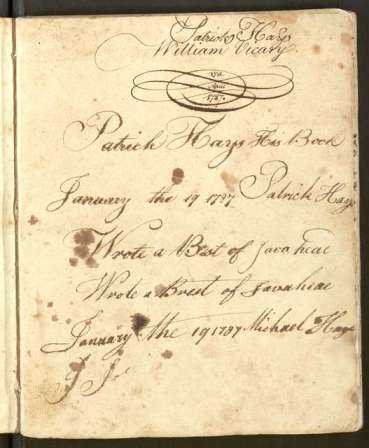 The document collection of Barry-Hayes offers a first-hand account of trade practices in the 18th and 19th centuries. Commodore John Barry, founder of the United States Navy, began and ended his career as a merchant ship captain, sailing the globe. Toward the end of his service to the industry, Barry brought his adopted son Patrick Hayes on a journey to China, which marked the beginning of Patrick’s maritime career. Quite fortunately, Patrick Hayes kept an extensive journal of his journey, giving us a glimpse into the adventurous life of a sailor. Many of Hayes’s entries also note his experience on board, not all of which were as pleasant as the weather. Early on in the voyage, Hayes learned a tough lesson about the darker side of seafaring when one of the sailors took his life with a shot of his pistol through his heart. The man left no note behind to explain his suicide, and he was committed to the sea, a sailor’s funeral. Later, Hayes notes after an abundantly successful fishing endeavor that “in a few Days fresh fish became nauseous to us all” and “in a day several of our people was poison-d by eating some of those fish that lay in the sun moon all night which was attended with no foul Consequences”. Hayes’s journal is an excellent resource for understanding a worldly view from the early American perspective. It is a glimpse into the life of a sea merchant, and is well worth a closer look. This journal represents only a small portion of resources available about American trade in the 18th Century. The Independence Seaport Museum hosts artifacts and documents that remind us of this nation’s independent embark into international trade. One document, a letter from congress introducing an American captain to the Chinese government, depicts an abundant display of respect in an attempt to show their dedication to international trade. Another series of documents from Captain John Green documents tips on how to trade in Asia, and with whom.